The team went through many iterations of its Pedal Drive, every time learning about what is needed for the next iteration. 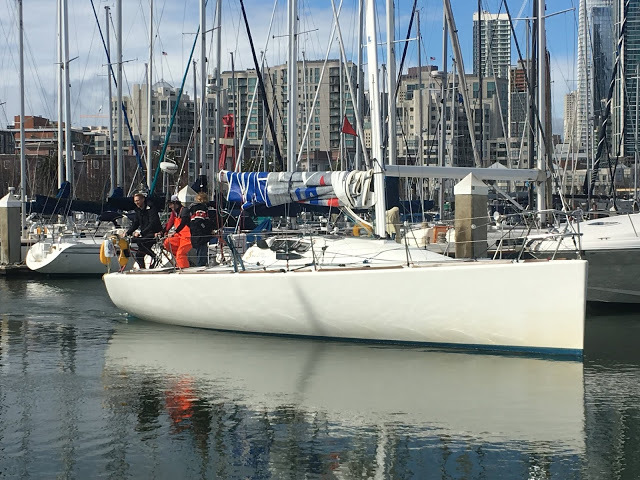 The first time we installed it, we confirmed that there was thrust, that perhaps we needed a slightly bigger gear and that the chain was jumping so we installed a different size crankset and a chain tensioner system. 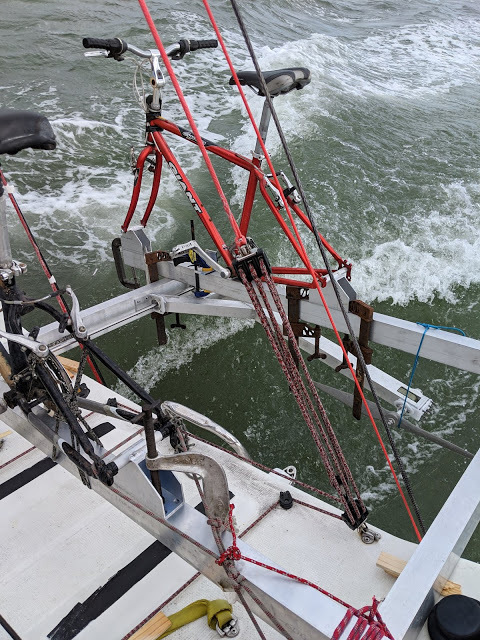 It was then time to try it out with fewer clamps and two real bikes on Vs just one - we also wanted to check the new chaining system as well as how the boat felt in more open waters while on the bike as well as the positions for the bikes on the beams so we can start engineering real mounts for them, Vs clamps. 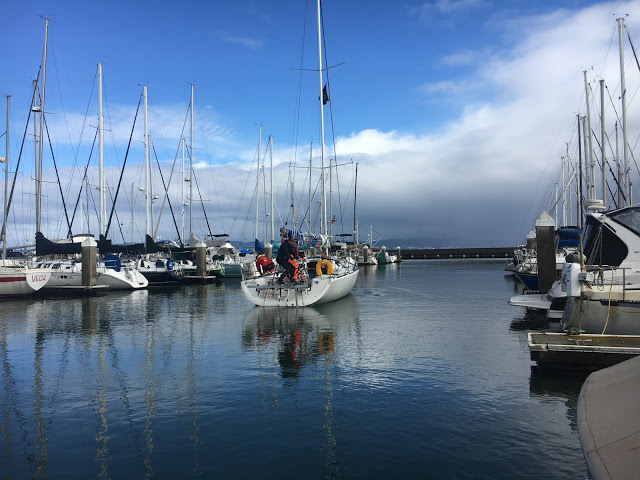 While the boat used the engine to exit the slip, it proudly left the harbor under pedal power. Team Shut Up And Drive putting the revised human powered system o the test. 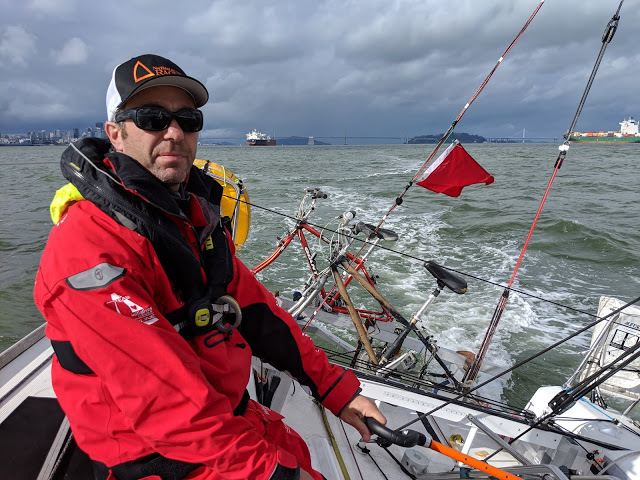 The bike solidly propelled the boat through the water - it was then time to start testing the drive under wind power to make sure that while the propellers were retracted out of the water, no part of the drive would touch the water and slow down the boat / be damaged by the force of the water. 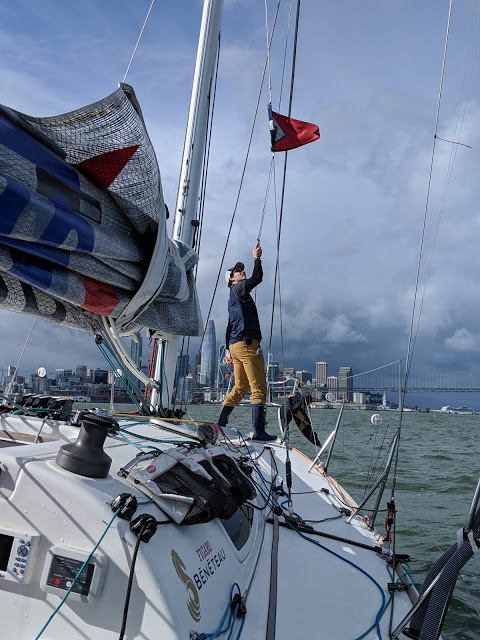 The team deployed the protest flag for some obscure reason since it wasn't technically a race but I guess that seeing a 300-ton ship in the distance was enough to make everyone feel like it WAS a race and protesting the ship for polluting is fair game. The super duper Pedal Drive somewhat contrasted with the Burning Man bikes but the bikes did give it some personality...All in all, we measured were the mounts needed to go and what size frame we needed to order and the boat could sail nicely without impacting the Pedal Drive despite heavy heeling. They seem to have some speed too, but I wonder how long the crew can peddle for?